Are you an already certified New Jersey teacher looking to earn an additional endorsement? This program provides currently certified New Jersey teachers, in any subject area, an endorsement to teach middle school mathematics and earn a Master of Science in Teaching and Learning with Middle School Mathematics Subject Matter Specialization through a combination of NJCTL Online Courses for Teachers, Online Field Experience Courses, Online MSTL Courses (CSU-Global partnership) and Praxis examinations. Upon successfully completing these Online Courses and passing the Middle School Mathematics (5169) Praxis, the candidate can apply to the New Jersey Department of Education for an endorsement to teach Middle School with Subject Matter Specialization: Mathematics in Grades 5-8. Please note that issuance of the Middle School with Subject Matter Specialization endorsement will be contingent upon eligibility and/or issuance of the Elementary School or N-12 subject matter certificate. For more details see: learning about the PSI and PMI curriculum. While NJCTL Online Courses for Teachers are asynchronous, so they can be taken anytime, anywhere, we recommend starting on suggested dates to be part of a cohort. Also, “virtual office hours” will be in place for each course using Zoom; by being part of a cohort, those Zoom sessions will be more productive. All content courses will be offered completely online through asynchronous courses. Teachers will still receive classroom coaching visits as part of the Field Experience Courses. Click here for NJEA pricing, reflecting 20% discount on NJCTL tuition. These graduate level classes taken with NJCTL must be transferred onto a CSU-Gloabl graduate transcript (restrictions and fees apply). Click here to learn more about having NJCTL credits transcribed onto a CSU-Global Graduate Transcript. 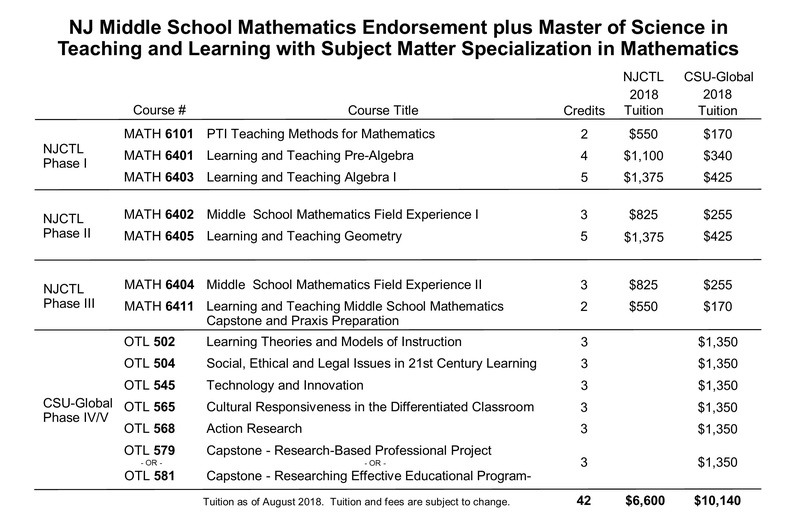 Click here for the NJCTL Middle School Mathematics Endorsement Program without MSTL. Click here for current NJCTL tuition rates. Due to NJEA being the founder and largest supporter of NJCTL; NJEA members receive a discount of 20% off of NJCTL Tuition. Financing is available through Greater Alliance Federal Credit Union (GAFCU), click here to learn more. All individuals who pay for the entire program up front (through GAFCU financing or other means) are entitled to a 5% discount for paying in advance.